is an association of persons with an interest in modern sport fencing and active participation in USA Fencing sanctioned tournaments at all competitive levels. 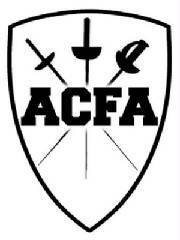 ACFA is a member club of USA Fencing and provides instructors for the fencing classes in the personal enrichment department of Amarillo College. ACFA practices in the Fencing Salle located in Russell Hall, Room 104, on the Washington Street Campus of Amarillo College in Amarillo, Texas. You can usually find one of the coaches at the Fencing Salle on Monday at 7:00 p.m.; Thursday at 7:00 p.m.; or Saturday at 10:00 a.m.
ACFA is a 501(c)(3) non-profit association, registered with the IRS. ACFA is sad to announce that Richard Howard has died. He spent the last day of his life at his home of many years, passing away on March 13th. His death appears to be from natural causes. Richard had suffered for many years the debilitating effects of Parkinson's Disease. Richard Howard founded the fencing program at Amarillo College. For many years, he was the instructor of continuing education fencing programs. Those classes eventually helped to create a club program that is now known as Amarillo Competitive Fencing Association. He was the first Head Coach of ACFA and has, for the last few years, served as Head Coach Emeritus. Coach Howard's Memorial Service will be held on Wednesday, March 16th, at 2:00 p.m. at the LDS Chapel, located at 2101 N. Coulter, in Amarillo. The Chapel is located in the Westcliff area just off of Tascosa Road. Amarillo Competitive Fencing Association is the Home Club of Juleah Nusz, the 2009 USFA National Champion in Junior Women's Epee. ACFA is currently working on a second website located at www.acfencing.org. It will be a more modern website and should eventually replace our current website. In the meantime, BOTH websites will remain online.